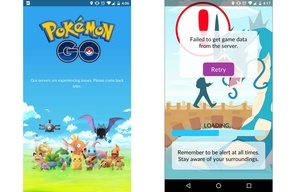 Pokemon Go, the biggest mobile release of 2016, has had to delay its international rollout following server issues for gamers playing in the U.S.
Niantic, the company the built Pokemon Go with Nintendo, says they are aware of the issues and are quickly working on a fix. Niantic CEO John Hanke says the rollout is "paused until we're comfortable," and that "We thought the game would be popular, but it obviously struck a nerve," which might be the understatement of the week following millions of downloads and tens of millions of playing hours. As of writing, the server issues are almost completely solved and gamers can continue to enjoy catching Pokemon in real life.